The information is intended as a guide only and should not replace the advice of a healthcare professional. You should rely on your own independent advice. No representation, assurance, warranty or under taking is given or made as to the suitability or accuracy of the information for any specific purpose or the relevance, appropriateness, accuracy or reliability of any opinions, conclusions, recommendations or other information (all of which matters may change without notice) contained in this document. Save for any statutory liability that cannot be excluded, People in Pain Network and its employees and agents disclaim and exclude to the maximum extent permitted by law all liability and responsibility (whether in negligence or otherwise) for any direct or indirect loss, damage or harm to personal property which may be suffered by any person relying upon the information presented in this website. 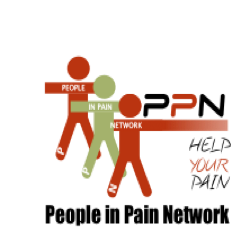 People in Pain Network does not assume any obligation to up date the information presented in this website. Provision of this information does not constitute endorsement by People in Pain Network of any product or organization referred to in it. We cannot guarantee the accuracy of the information presented in this website. The information presented in this website us derived from third party sources. You should only rely on information and advice provided by your independent healthcare professional.